The Sheraton Suites Houston Near the Galleria is ready to greet you with a pleasant and comfortable stay as soon as you step into our lobby. Our full-service, all-suite hotel puts you close to the excitement at the George R. Brown Convention Center, Reliant Park, Minute Maid Park, Toyota Center, BBVA Compass Stadium, Museum District, downtown Houston, and the world-renowned Texas Medical Center.Spend the day browsing the Gallerias extravagant shops and day spas, just two blocks away, and then return for a refreshing swim in our outdoor pool. Make time for a good workout at Sheraton Fitness.Along with uplifting views from the 15th floor, our Sheraton Club Lounge provides complimentary continental breakfast and evening hors doeuvres. You can also gather with family, friends, or colleagues for some delightful food and conversation at Sage, our new restaurant.Fully unwind in one of 283 spacious suites, beautifully appointed and furnished for a memorable stay. Separate living areas include work desks and ergonomic chairs. Stay connected to colleagues or loved ones with our complimentary wireless High Speed Internet Access. 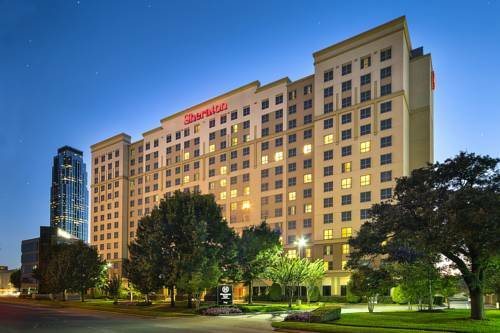 Separate bedrooms feature the plush Sheraton Signature Sleep Experience, while our bathrooms provide Shine for Sheraton amenities.Find a great hotel convenient to Houstons major airports and attractions at the Sheraton Suites Houston Near the Galleria. With a twist of cosmopolitan flair and a touch of Texas hospitality, Houston is both friendly and diverse. The uptown, Galleria area exudes its own distinct character and caters to international visitors and Houstonians alike. Each year, thousands of international visitors convene here for shopping, conventions, and business. One block from our hotel you will find the fifth largest shopping complex in the nation, with some of the best and most glamorous shopping in the world. Houston's most popular attractions are also just minutes away, such as Reliant Stadium, Minute Maid Park, downtown, the Theater District, Houston Zoo, Texas Medical Center, and the Museum District. Sip away the afternoon with your favorite beverage. Evenings find our guests gathered to sample one of our signature Bourbons, Single Malt Scotches, or a variety of designer Martinis, plus an extensive wine list.